Meldreth Landscapes is a company that has been long established in the Cambridgeshire and Hertfordshire area. We provide a team of landscapers with years of experience, which in conjunction with good customer feedback and cooperation provides a landscaping service tailored to you. All of the services we provide are guaranteed and insured. We can also provide custom designs or sizes, such as for fence panels or gates, so you receive the product that is right for you. For a free no obligation quote or any enquiries please do not hesitate to contact us. 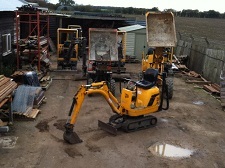 Meldreth Plant specialises in plant and tool hire and has a wide range of equipment available. Delivery and collection can be arranged, and there also trained personnel to operate any of the machines sent out to hire. For further information please click on the image below to enter the site.